Former top company officials responsible for the Fukushima Daiichi power plant pleaded not guilty Friday as they stood trial for their alleged failure to prevent the nuclear meltdown disaster triggered by the 2011 tsunami. Appearing before the Tokyo District Court for the first criminal trial over the disaster, Tsunehisa Katsumata, 77, then chairman of plant operator Tokyo Electric Power Co., started with an apology but added, "It was impossible to predict the accident." Two former vice presidents also pleaded not guilty in line with the expected argument from the former officials' defense -- that there was no way to foresee the massive tsunami waves, triggered by a magnitude-9.0 earthquake, which engulfed the seaside plant and crippled key reactor cooling functions. It took Fukushima residents and their supporters more than five years to bring the three former key officials before a criminal court, as prosecutors had twice decided not to charge them. After a decision by prosecutors was overturned by an inquest of prosecution made up of ordinary citizens for the second time, Katsumata and the two other defendants -- Ichiro Takekuro, 71, and Sakae Muto, 67 -- were finally indicted last year. They are facing charges of professional negligence resulting in the injury of people at the site as well as in the deaths of dozens of patients forced to evacuate from a hospital near the plant. The case, overseen by a panel of three judges with a group of specially appointed lawyers acting as prosecutors, is not expected to see a ruling at least until next year. At the trial, the specially appointed lawyers argued that the three former officials had been able to predict that the plant, located on grounds 10 meters above sea level, could be swamped by tsunami waves as big as those that hit the site on March 11, 2011 following the earthquake. "They should have suspended the operations of the reactors until they have taken measures (to protect the plant) such as by building seawalls, making reactor buildings watertight or moving reactors to higher ground," the lawyers said. Past investigations have already shown that a Tepco subsidiary estimated in 2008 that the plant could be hit by up to 15.7-meter-high tsunami after a government panel warned of risks of a magnitude 8.2-class quake occurring in waters off the Fukushima plant. The data was relayed to Takekuro and Muto, who were in charge of Tepco's nuclear business at that time, and was also "very much likely" reported to Katsumata by June 2009 at the latest, according to an independent committee of ordinary citizens that reviewed the prosecutors' decision against laying charges. Katsumata, however, explained to prosecutors that he has "no memory of having been briefed" on the information. A major reason prosecutors decided not to pursue a criminal case was their belief that the nuclear accident was unavoidable, even if the three had decided to introduce tsunami countermeasures based on the 2008 data. The estimate suggested the need to build a seawall on the south side of the plant, covering a coastline of about 300 meters. But in March 2011, tsunami around 14 and 15 meters high flowed from the east side of the plant, facing the Pacific Ocean, affecting a far longer coastline. 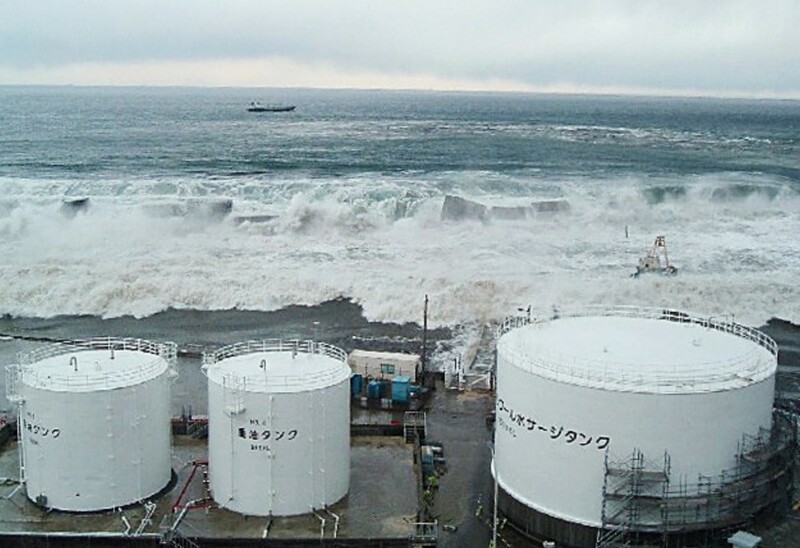 On March 11, 2011, tsunami flooded power supply facilities at the six-reactor plant and crippled reactor cooling systems. The Nos. 1 to 3 reactors suffered fuel meltdowns, while hydrogen explosions damaged the buildings housing the Nos. 1, 3 and 4 units. Faced with massive liabilities following the disaster, the plant operator received a government bailout and was restructured as Tokyo Electric Power Company Holdings Inc.
At least 150,000 people in Fukushima were forced from their homes at one point amid radiation fears and over 20,000 people are still subject to evacuation orders, while the country faces huge challenges in scrapping the crippled reactors. Moves to take Tepco executives and government officials to court began in 2012, with a group led by Fukushima citizens filing a criminal complaint against over 50 of them. Prosecutors decided not to file charges, but decisions against Katsumata, Takekuro and Muto were overturned by the Committee for the Inquest of Prosecution. 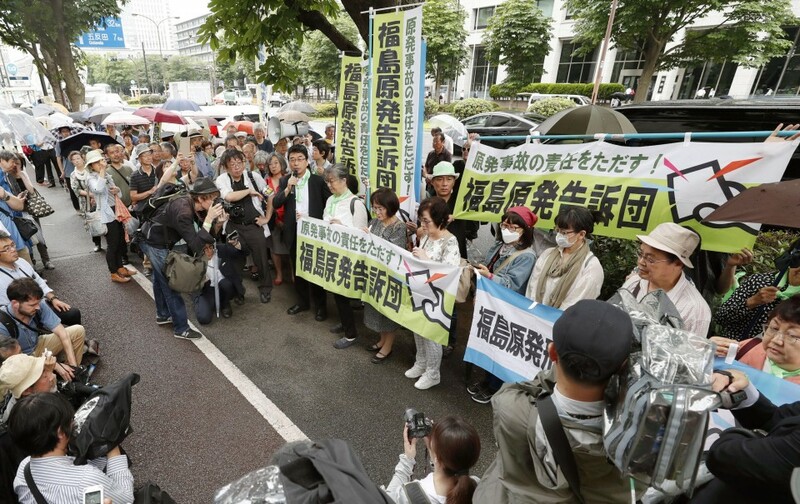 Near the Tokyo District Court on Friday, some people who are suing Tepco in other lawsuits and their supporters were seen holding banners saying "We don't need nuclear power plants." A 65-year-old housewife who is supporting lawsuits involving Fukushima evacuees said, "I hope we will get to know the truth (through the trial)." Ruiko Muto, a native of Fukushima who leads the plaintiffs' group, has expressed hope that the trial will deliver justice. "The accident has affected the lives of hundreds of thousands of people. No matter how many years it may take, we expect the trial to be a meaningful one that makes clear who was responsible."